This document demonstrates how to add/edit hours for use in Spaces and D!bs. Click here to view a short video overview of the, "Location Setup" area. To access the Location Setup area, you need to first be sure you’re logged in at the admin permission level. Choose the "Settings" button and select the "Location Setup" option from the drop-down menu. From the "Location Setup" list view, choose the pencil "Edit" icon to the right of the location name you wish to add or edit hours. Click on the pencil "Edit" icon on the top-right above the hours table to make the hours editable. After you have hours input into a location (branch), you can copy those hours to a selection of spaces assigned to that same location. This can prove to be a huge time saver as you assign the same hours to multiple spaces at once. While in the hours section of a location, select the "Copy To" icon at the top-right of the hours chart, to open the copy hours dialogue pop-up window. 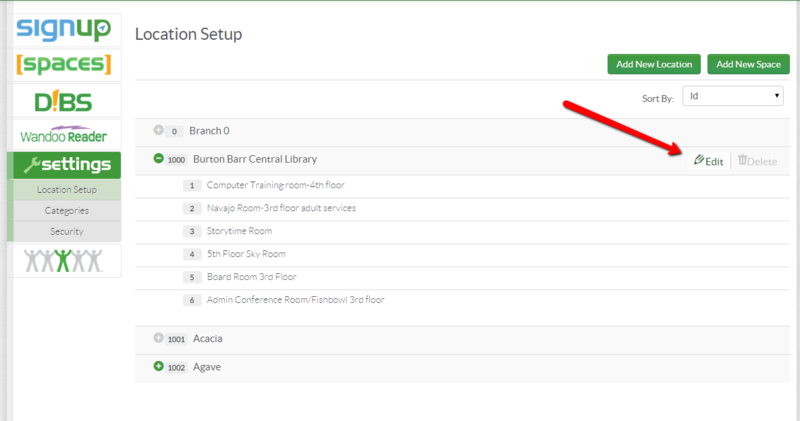 Select the rooms in the location you wish to copy the location hours to and select "Yes"
You may want to edit the hours in an individual space, so that they are different then other rooms in your library branch. From the "Location Setup" list view, choose the pencil "Edit" icon to the right of the space name (not the location name). "Alternate Hours", is a way to go about temporary closing your library due to holidays, or to shorten your hours due to the summer season, etc. From the "Location Setup" list view, choose the pencil "Edit" icon to the right of the location or space name you wish to add or edit Alternate Hours for. Just like standard hours, after you have alternate hours input into a location (branch), you can copy those hours to a selection of spaces assigned to that same location, saving you time. While in the alternate hours section of a location, select the "Copy To" icon at the top-right of the alternate hours chart, to open the copy hours dialogue pop-up window. Posted - Tue, Oct 7, 2014 at 11:32 PM. This article has been viewed 6051 times.